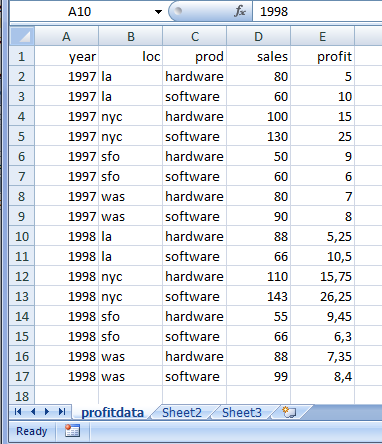 This tutorial gives an overview on how to exchange data between GAMS and Microsoft Excel. GAMS can communicate with Microsoft Excel via GDX (GAMS Data Exchange) files. In order to write data from GAMS and to Excel, selected GAMS data can be written into a GDX file and then to an Excel file: GAMS -> GDX -> Excel. Similarly selected Excel data can be written to a GDX file and then read into GAMS: Excel -> GDX -> GAMS. Some of GAMS/Excel data exchange tools that provide functionality to exchange data between GAMS and Excel are also discussed in the section Data Exchange Tools. The data exchange between GAMS and a CSV (Comma-separated values) file format and GAMS is covered in Data Exchange with Text Files. Consider the following modication of the [TRNSPORT] model from the gams model library. For the first call for x.L, there is no range specified and the data is written in cell A1 and beyond in the first available sheet. For the second call for marginals x.M, data will be written to cells F1:I4 in the sheet named NewSheet. Note that GAMS can also write data into a GDX file during compile time. It is also possible to convert data stored in a GDX file into an Excel file spreadsheets using GDX2XLS tool and to write GAMS data to standard output formatted as a GAMS program with data statements using GDXDUMP tool. Consider the following modifciation of the [TRNSPORT] model from the gams model library and the file results.xls file created from the previous example. The command $call above executes a program called GDXXRW during compile time. The GDXXRW reads data from the range A1:D3 in results.xls into a GAMS parameter called Level in the GDX file results.gdx. As an output GDX file is not specified when calling GDXXRW, the output file will be derived from the input file by changing the file extension of the input file and removing any path information. The first command $gdxin specifies the name of the GDX file results.gdx to be read. The command $load reads parameter Level from the GDX file. The second command $gdxin closed the GDX file. GAMS can read from a GDX file either during compile time or during execution time. See Example 4 - Reading a GDX File when reading data with domain information and Example 5 - Reading a GDX File when reading from a GDX file during execution time. Note that it is also possible to write all worksheets of an Excel workbook into a GDX file using XLSDUMP tool. There are a number of tools that provide functionality to exchange data between GAMS and an Excel file. This section discusses some of the data exchange tools with some examples. The complete list of the tools can be found at GAMS/Excel Data Exchange tools. GDXXRW is a tool to read and write Excel spreadsheet data. GDXXRW can read multiple ranges in a spreadsheet and write the data to a 'GDX' file, or read from a 'GDX' file, and write the data to different ranges in a spreadsheet. How to use GDXXRW to exchange data between GAMS and Excel is covered in the section From GAMS to Excel and the section From Excel to GAMS. More details on usage and examples of GDXXRW tool is covered in GDXXRW. XLS2GMS is a simple utility that allows you to extract data from an Excel spreadsheet and convert it into a GAMS include file. XLS2GMS can be run interactively or in batch mode. Notice the B parameter, which is needed as there are embedded blanks in the labels. 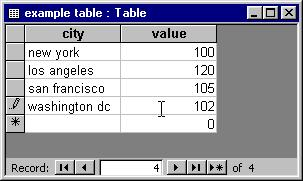 In some cases it is convenient to consider tabular data in an Excel spreadsheet as a database table and to import it via GDX file using the SQL2GMS tool. GDXVIEWER is a tool to view and convert data contained in GDX files. It can also export to csv, xls, xml-files and pivot tables. The usage and examples are covered in GDXVIEWER. GDX2XLS tool o conver the contents of a GDX file into an Excel file or an xml-file. The usage and examples are covered in GDX2XLS.